Every day we download videos from the Web, copy movies from DVD and USB drives, download our own videos from digital cams. Over the time, these files produce many duplicates as we copy original videos to different folders, rename files, download similar videos with different encoding and edit original movies, saving edited copies to disk. As duplicate videos grow in number, video organizing becomes difficult as those files become a source of confusion when you are looking for an original and take up disk space. Trying to find duplicates manually may cost hours and sometimes even days of searching through the folders, watching and comparing files to decide what stays and what needs to go into the trash bin. Fortunately, there is a better method of searching duplicate video that takes the burden of manual searches off your shoulders. 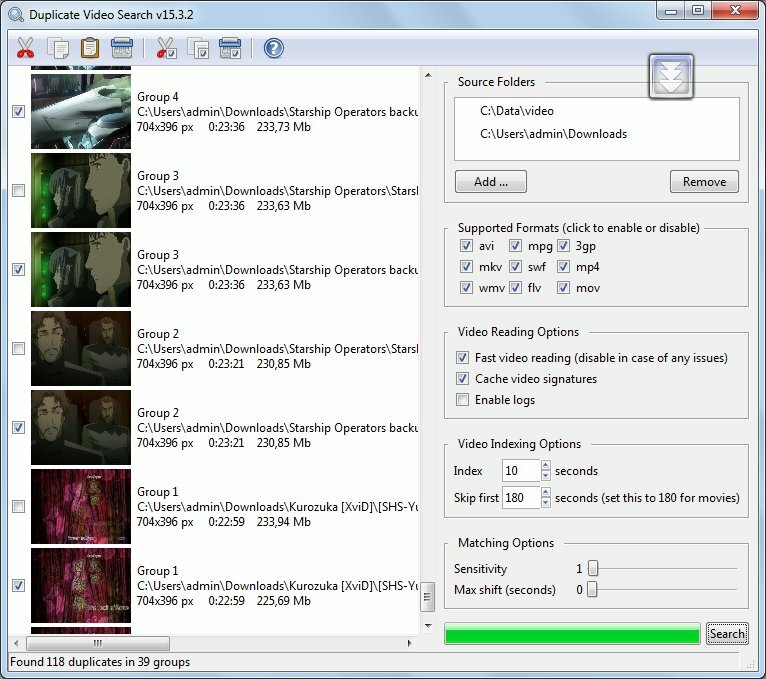 Duplicate Video Search is a duplicate file finder which is specifically designed for finding duplicate videos. It doesn't merely compare file names or control checksums; the program compares videos by the actual content. This is especially important, because you may have files with different names but same content, or identical videos in different formats. Unlike traditional duplicate file finders, Duplicate Video Search can easily identify duplicates among them. Using its content-based algorithm, the program literally looks at the actual contents of the files in the selected folder, compares them against each other, and then arranges similar videos into groups. And that is not all! Also the program identifies the original and duplicates in a group and does so regardless of their location on the disk or format. An original remains unmarked, while all duplicates are marked automatically with ticks in the checkboxes next to each one, so you only need to confirm their removal with a click - no sorting is involved!